Match report by Tony Russell, and photos courtesy of Andrew Collins. 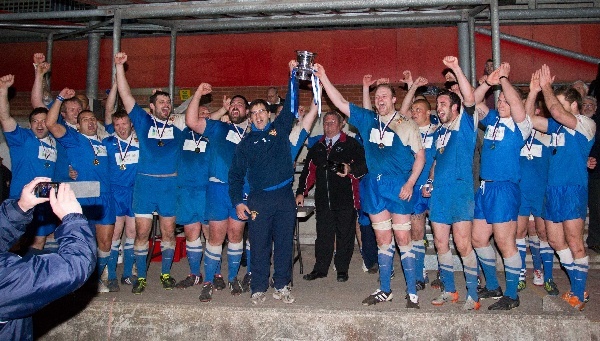 Weston lifted the Somerset Cup for the tenth time, and for the fourth time in the last five years in a tight, highly competitive and well supported contest at Bridgwater which must have pleased the organisers. The Seasiders were strangely subdued for much of the first half in stark contrast to the Bristol side, who will be joining WSM next season in Nat. 3, having been promoted, and who came out with all guns blazing, wary of Westons’ well proven forward strength and determined to get “their retaliation in first. “ They certainly looked the livelier team for the first half. Mackay opened the scoring for Weston with his first penalty which was quickly matched by a similar score from Partridge. Mackay increased the lead with his second but fly half Schropfer benefitted from some poor tackling to score at the posts for a seven pointer and a 10-6 lead. Mackay emulated his opposite number with a fine try from 30 metres, also converted to edge Weston into a 13-10 half time lead. However, the talking point on Bridgy’s popular side was how the Reds 6 had escaped admonishment for his’ frustrated’ act at the end of the half. This appeared to be the start of a number of incidents where the touch judges failed to help the referee. The Reds opened the second half scoring with a converted try from Fry, one of three ex Weston players now turning out for the Bristol side. Mackay kicked two more penalties to one by Partridge for Reds to lead narrowly by 20-19 with 25 minutes remaining and Weston reduced to 14 men, courtesy of Morrisseys’ invitation to spend ten minutes on the sidelines. Weston finally roused themselves as the forwards gradually got on top, gaining ground and winning more possession. Morrissey, who had only been back on the pitch a minute or two picked up and dived over in the corner following a concerted forward rush. Critically, Mackay converted from the touchline for a 26-20 lead. Old Reds came back with a corner try from Woodward, which once again should probably have been stopped. Partridge kicked an excellent conversion to ease his side one point ahead. Shortly after this, both sides were reduced to 14 men. Swann saw yellow for Weston and Kempton saw red for his protracted impersonation of Mike Tyson. There were now only two ex Weston Reds players on the field. Weston took up residency near the Reds line, maintaining possession and gradually, and for the umpteenth time this season, driving their opponents back for prop forward Hobbs to get the touchdown. Mackay once again converted with a fine kick…..33-27 to Weston with five minutes remaining. Reds were not finished and in a final flourish, Fry, (somewhat too easily), crossed for his second try midway between the posts and the corner…..33-32 with the conversion to come….Interesting!! Partridge, whose kicking had matched Mackays’ throughout the match, succumbed to the pressure and dragged his kick just to the left of the upright, breaking dozens of Brislington hearts. Weston stuck the ball up their shirts and played out the final minutes. Not Westons best performance of the season by a long way, but a tribute to all players for dogging it out against pumped up opposition, and sneaking the result where it mattered. At the beginning of the season, all concerned would gladly have taken third place in the League and to win the Somerset Cup again….Objective achieved !! Well done to all the players, coaches and management.